When the Drum Corps International World Championships first went to Massachusetts in 1994, Foxboro Stadium was 23 years old. It had only seven more years left before it would be demolished to become a parking lot for the larger Gillette Stadium, home of the 2005 DCI World Championships. A lot happened in drum corps during those 11 years between visits to the suburb of Boston; electronic amplification became legal by DCI rules, color guards finally were awarded with their own caption on the judges’ score sheets, and any-key brass instruments, legalized for the 2000 season, were now the standard for all major corps. 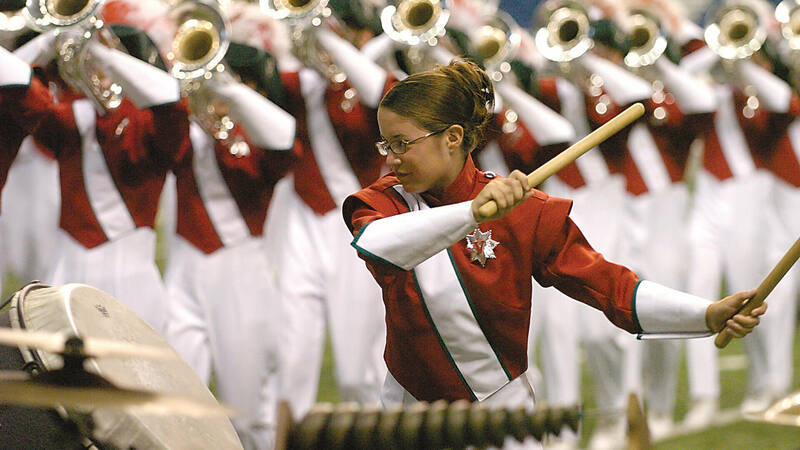 By winning all top caption honors in 2005, the Cadets matched the Cavaliers’ record-breaking score of 99.15 from 2002, with uniforms that looked the same going and coming. Cavaliers and Phantom Regiment took the next two positions, topping Blue Devils, who took three weeks off during the season to visit Europe. 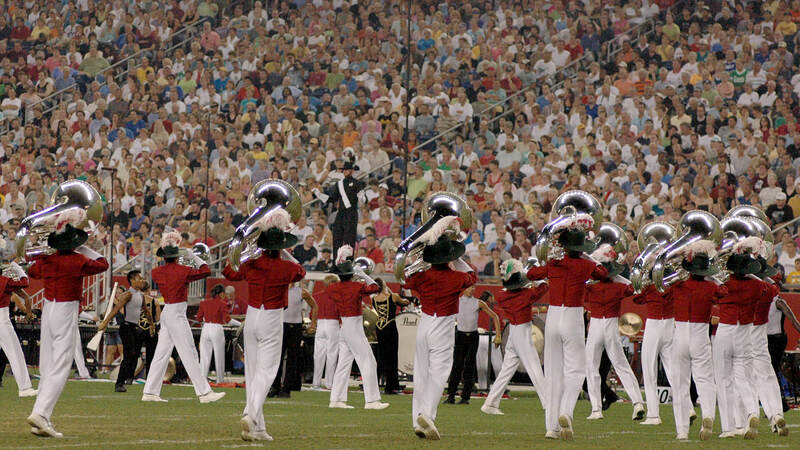 Competitively, the 2005 season was rough on Santa Clara Vanguard, with the corps finishing the season in eighth place, its lowest placement ever. However, that was an improvement on the ninth-place finish the corps experienced at the DCI regional events in San Antonio and Indianapolis, and also at the World Championship Quarterfinals and Semifinals in Foxboro. The corps’ production, “Russia: Revolution/Evolution: 1917-1991,” traced the period of time starting with the collapse of the Russian Empire in 1917, dismantling the centuries-old dictatorship of Tsars and Emperors and making way a few months later for the Bolshevik Revolution that was led by Vladimir Lenin. The time span referenced in the title ended with the collapse of the Soviet communist system in 1991, which resulted in the independence of several former Soviet republics. The show was bookended by movements from Alfred Reed’s “Russian Christmas Music,” written in 1944 for a concert by the 529th Army Air Force Band, in which he served as arranger. Reed, who died exactly five weeks after the 2005 DCI World Championships, is known as one of the most prolific composer/arrangers for concert bands and is noted for having created the first college-level music business degree program at the University of Miami. The concert for which “Russian Christmas Music” was written was held in Denver to promote and improve Soviet-American relations toward the end of World War II. The concert was broadcast nationally over the NBC radio network, just 16 days after Reed was presented with instructions to compose a work for the event. Reed’s piece was inspired by the a cappella vocal music of the Eastern Orthodox liturgy. A familiar tune to Santa Clara Vanguard, the corps first played “Russian Christmas Music” in 1987 during its costumed spectacular that went undefeated until the last two shows of the season. A minute’s worth of “Carol” from “Russian Christmas Music” (also known as “Carol of the Little Russian Children”) started Vanguard’s 2005 show with the horns playing softly to the backfield. As soon as corps members turned to face front, they launched into the violent strains of “Revolutionary Petrograd,” the first movement of Dmitri Shostakovich’s “Symphony No.12: The Year 1917,” written in 1961 and dedicated to Bolshevik Revolution leader Vladimir Lenin. The intense and brutal brass passage, based on a revolutionary song utilizing the lyrics, “Shame on you tyrants,” led into corps members forming a 45-yard-wide drill formation of a hammer and sickle, a symbol of the Communist Party. The first section of the show ended with brass players in the outline formation of a five-pointed star, a symbol known as the “Red Star” and also a well-known communist symbol. The piece wrapped up with a brief recap of the main theme of the symphony’s first movement, combined with a brief hint of the ending of the fourth and final movement, “The Dawn of Humanity,” as the horns formed another star with its points filled in. For this week only, you can save on the DVD set that contains this Santa Clara Vanguard performance. Buy the 2005 DCI World Championship DVD set. Discount ends Monday, November 28, 2016. Michael Boo was a member of the Cavaliers from 1975-1977. He has written about the drum corps activity for more than 35 years and serves as a staff writer for various Drum Corps International projects. Boo has written for numerous other publications and has published an honors-winning book on the history of figure skating. As an accomplished composer, Boo holds a bachelor’s degree in music education and a master’s degree in music theory and composition. He resides in Chesterton, Indiana.